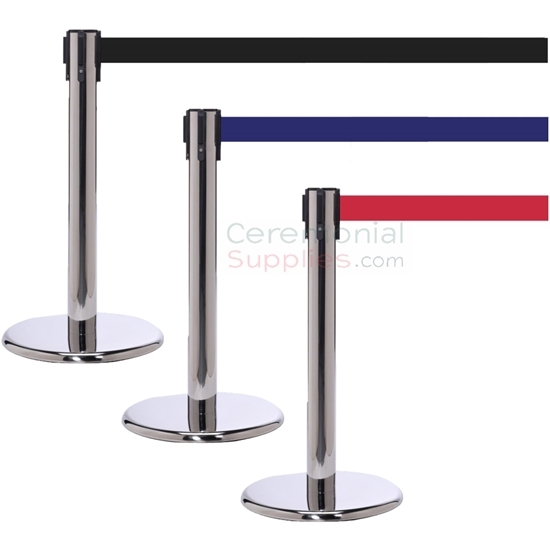 This Mini Chrome Stanchion is ideal for attracting the crowd’s attention to any item on display which makes it perfect for museum exhibitions or art shows. Its mini stature allows for high visibility while still maintaining a barrier between the crowd and the display item. Their shiny chrome finish makes this optimal to use in any high class event. The stanchion’s retractable belt extends up to 11 feet almost doubling the length of a regular sized stanchion. This offers more area coverage and, of course, cost savings. The retractable belt is available in three different colors: Black, Red, and Blue. Stanchions are sold separately to meet your exact needs.